Comic-Con attendees will have a once-in-a-lifetime chance to enter the mind of Professor X. 20th Century Fox has created an "X-Men"-themed virtual reality stunt especially for the pop-culture convention, which kicks off Thursday in San Diego. The interactive digital experience utilizes the Oculus Rift virtual reality headset, which is not yet available to consumers, to simulate the fictional Cerebro technology used to track down mutants by the character portrayed by Patrick Stewart and James McAvoy in the "X-Men" films. The 360-degree, 90-second virtual adventure will take place on the Comic-Con show floor inside Fox's booth, where attendees will sit in a replica of Professor X's wheelchair and virtually hunt shape-shifting mutant Mystique in the San Diego Convention Center. Each experience will be recorded and made available for users to share on social media. Fox is using the VR stunt to promote the Oct. 14 Blu-ray release of "X-Men: Days of Future Past." At its booth on the Comic-Con show floor, the studio will sell limited-edition copies of a Blu-ray box set that includes all the "X-Men" films in a replica of the Cerebro helmet. It won't be the only use of an Oculus Rift headset at Comic-Con. Outside the convention center at an interactive zone at Petco Park, Fox is also employing the VR technology to transport users to the fictional town depicted in the TV series "Sleepy Hollow." The second season of the supernatural series is set to debut on the network this fall. Fox's use of the technology at Comic-Con is the latest example of how Oculus is making in-roads with Hollywood. HBO similarly used the technology to promote "Game of Thrones" with a virtual rendition of the fantasy series' icy 700-foot-tall wall during a recent exhibition. 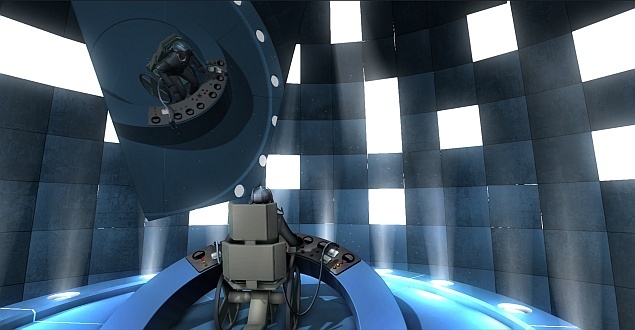 During a demonstration of the "X-Men" experience to The Associated Press ahead of its Comic-Con debut, the short interactive film narrated by a Patrick Stewart sound-a-like mimicked what it might look like to roll into the iconic domed Cerebro chamber depicted in the "X-Men" films and harness Professor X's telepathic powers to spot characters like Wolverine in a crowd. Over the past two years, Oculus' immersive VR technology, which covers users' eyes and reacts to head movement, has received considerable attention from video game developers, but it hasn't been released yet for consumers. Facebook purchased the company behind the technology earlier this year for $2 billion. Several networks, studios and publishers use Comic-Con to hype their upcoming entertainment releases with premieres, panels, autograph sessions, one-time-only stunts and interactive attractions in downtown San Diego. This year's promotional efforts include Ubisoft's "Assassin's Creed: Unity" obstacle course and Paramount and Pizza Hut's full-size replica of the Pizza Thrower vehicle - complete with a working pizza-tossing cannon - from "Teenage Mutant Ninja Turtles."